Dunstable Downs is situated inside Luton CTR/CTA – Class D controlled airspace, surrounding London Luton Airport (LLA). Further information can be found using the current edition of the CAA 1:500,000 or 1:250,000 airspace maps. Before flying Dunstable please make sure that you have read and meet all the legal requirements. It is a legal requirement that all pilots using the agreed airspace be a DHPC member, a BHPA member, and have a minimum of Club Pilot (CP) rating as well as being familiar with the terms of the agreement and have received the mandatory Airspace Briefing. Pilots are not allowed to fly Dunstable Downs until they are signed off by the DHPC Lead Coach as having received the Airspace Briefing and been provided with a lifetime Airspace helmet sticker. It is an offence to fly at Dunstable without meeting these requirements. Breach of these rules could land you in prison or a £2,000 fine. Dunstable Downs is a popular location attracting families, picnickers, dog walkers, horse riders, kite flyers, sailplanes, and of course paragliders and hang-gliders. DHPC members must be seen to be responsible users of the site and remember that other people have as much right to be there as we do. Managed by the National Trust headquartered at the Chilterns Gateway Centre, parts of the Downs are designated as a Site of Special Scientific Interest (SSSI) and members are expected to respect this, be mindful of other users and to cooperate with the wardens at all times. Use of airspace at the Downs for foot launched flying is legally sanctioned by a CAA Exemption Order restricting it to DHPC members. Only DHPC members can fly hang-gliders or paragliders there and must abide by the terms of an associated Letter of Agreement (LoA) with the London Gliding Club (LGC) and the National Air Traffic Service (NATS). The London Gliding Club also use the airspace at Dunstable Downs. It is important that you are competent in flying in a mixed discipline environment. The distance record for Dunstable is 157.6KM set on 28th April 2016 by Karoly Megyesi. See XC league for track log. Previous record holders were: 2013 April 22nd, Andrew Hollidge on a hang-glider. 153.9km. Wind Direction: Southwest to Northwest (220˚- 320˚). Top to Bottom: 230ft (70m) from the Middle Car Park Launch. Directions to the Site. The Downs is situated approximately 1 mile west of Dunstable town centre, just off the B489 Tring Road, which runs from Dunstable to Ivinghoe. Postcode for Satnav: LU6 2GY (which is the Chiltern Gateway Centre on the Downs). All pilots must have working and calibrated Altimeter when flying at Dunstable Downs. The London Gliding Club (LGC) open the airspace known as 'Dunstable Gliding Area 1' (see above airmap - yellow area) with Luton Control, every morning and close it again in the evening - when the LGC have finished flying. Therefore, if the LGC are NOT operating, then all pilots must stay within the CRSA at all times up to a maximum altitude of 1,500ft (457m) AMSL, regardless of whether you have signed in or not. Remember: If the LGC are not operating, you must NOT enter 'Dunstable Gliding Area 1'- even if you have already signed in. All Pilots must be BHPA and DHPC members. Airspace Helmet Stickers are checked. All gliders must be certified or registered to guarantee insurance cover. All pilots must have received the mandatory Airspace Briefing from the DHPC Lead Coach before flying at Dunstable. The Downs is located within the CRSA (Chiltern Ridge Soaring Area) which has a maximum altitude of 1,500ft (457m) AMSL - which is 703ft (214m) above the hill Trigpoint. Pilots who have not signed-in either electronically via the Club website or personally at the London Gliding Club (LGC) are limited to a maximum altitude of 1,500ft (457m) AMSL. 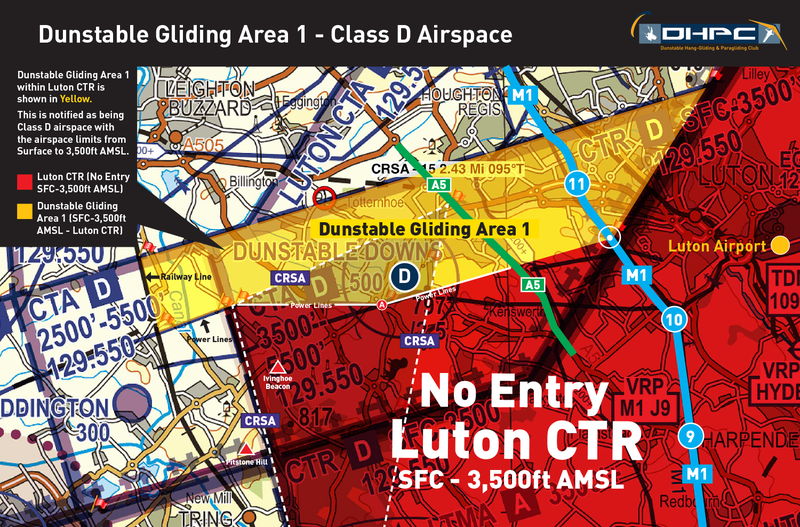 Any Pilot wanting to access the airspace above the CRSA up to the maximum altitude of 3,500ft (1,066m) AMSL within the permitted area designated; “Dunstable Gliding Area 1” (shown on the map above), must sign in either electronically, using the Club website, or personally sign-in on the wipe-board in the London Gliding Club reception. LGC will contact Luton Airport ATC and take control of the airspace. Pilots having signed-in, when flying ABOVE 1,500ft (457m) AMSL are NOT allowed to fly south beyond the main Power Lines crossing the ridge. Club Pilot (Tow) – Tow rated hang-glider or paraglider pilots are not allowed to fly any DHPC site until they have a Hill Endorsement issued from a BHPA Registered School. Club Pilot (Hill) – Under 10 hours can fly only after having discussed their flight plan with a DHPC Club Coach actually present on site. It is the pilots own responsibility to seek out a coach and discuss their flight plan. Pilots with less than 10 hours post CP must also remain within the boundaries of the CRSA – 1,500ft (457m) AMSL. Club Pilot (Hill) – New to the site must attend an Airspace Briefing with the DHPC Lead Coach before flying the site for the first time. Members must obey Airlaw and the terms of the Letter of Agreement issued by the CAA (which carry the force of law) at all times. CRSA airspace regulations require visibility greater than 5km. As a guide Ivinghoe Beacon is approximately 5km from the Downs. Paraglider pilots must not launch in front of the hang-glider launch point, nor in front of parked hang-gliders as there is a high risk of serious injury and equipment damage in the event of them being dragged backwards. Inexperienced pilots should stay north of the Elephant (the part of the ridge facing Northwest, to the left of the main paraglider launch) and not fly towards the old N/W hang-glider launch at or below ridge height, if there is a risk of sinking out to the bottom of the hill. You must slope land only if you get low. There is no excuse for landing in the Gliding Club. Take off and land only in designated areas. This site is an SSSI. To help ensure our continued use of this site it is vitally important that you launch in designated areas only. General advice for paragliders. Setup near the edge. Do not be tempted to setup further back to take a run up, it is not effective and you risk being blown into the road. On light wind days, please adopt a co-operative attitude to avoid causing others to bottom land. Do not linger in the bowl as this can block the hang-glider top landing approach onto the Pimple. The surrounding airspace is Class D. Model aircraft, SPHG's, Paramotors and Drones (SUA's) are not permitted and no assumptions can be made that the airspace is open, when flying in from another site. XC’s require a north-easterly track to avoid airspace. Downwind XCs are restricted by airspace when the wind is west or northwest. Low airtime paraglider/hanglider pilots (CP under 10 hours) must discuss a flight plan with a Club Coach before launching from any of the take off points. For additional advice about flying techniques at Dunstable Downs, mainly aimed at new low airtime members of the Club, see the Club Coaching page. Paragliders: Club Pilot rated (minimum) paragliding pilots may use this launch, but beware of rotor from the bushes in the gulley especially if the wind is a long way off to the South. Conditions at ground level can be deceptive. There is a risk of being blown back towards the road by higher wind speeds if launching too far back from the fence line. Hang-gliders: This launch is only suitable for Advanced Pilot (AP) rated Hang-glider pilots. The fence in front of take off and rotor from surrounding trees in the gulley make this launch extremely dangerous, especially if the wind is a long way off to the South or North. Hang-glider wings are a lot closer to the ground than a paraglider wings and consequently more susceptible to the rotor from the trees. West Southwest Launch: Paragliders may land back at the launch point but be aware of obstructions such as other gliders and the public using the ridge and do not top land there if it’s crowded with spectators. Hang-gliders also use this launch, so keep take-off areas separate and be aware of each other when launching. Pimple Launch: Mainly used by Hang-gliders after top landing. Located at the north end of the ridge. Used as a second time launch having top landed on the pimple. Do not fly or launch here in a Southerly wind as turbulence from the main ridge can be severe at times. The Pimple Launchpoint is unsuitable for low airtime pilots. Can be used in a Southwest through to Northwest as a take-off. This launch is also the Top Landing area so be aware of other Hang-gliders approaching to land behind you as you manoeuvre towards the edge of the hill. North-West Launch (in front of the Chiltern Gateway Centre): So called because it offers the closest launch to the more NW facing part of the ridge incorporating the power cables. A NW wind comes from the right and as such makes this launch difficult to use safely. This is an historic launch point used when we could top land where the Visitors Centre is positioned now. A long walk to access and no longer recommended for safety reasons. Recommended for hang-gliders only. Pilot (P) rated members and exceptionally (CP) members are allowed but only under the direct supervision of a Pilot rated DHPC coach. Intermediate gliders may not always reach the bottom landing field if conditions are not suitable for soaring. Land only in designated areas. If there is a risk to yourself, other pilots or members of the public then land at the bottom. The DHPC Middle Car Park: Experienced paraglider pilots only with a minimum of CP rating. It is permissible to land in the two top landing areas on either side of the Main Paraglider Launch Area. Land according to wind direction and having noted any obstructions in your chosen landing area. Do not land too close to the road if the wind is strong, you may be dragged back onto the road! Use the correct landing area suited to the wind direction. Overflying the take-off at low altitude is not necessary and MUST be avoided. Hang-glider pilots do not attempt to land here under any circumstances! This landing area often suffers with a very strong wind gradient on the approach. So much so that attempting a top landing in a NW is not recommended as the pimple lee side air sinking in the bowl makes the approach height very difficult to judge and the air often remains turbulent near the ground. An over shoot in this direction can put you an uncomfortably long way from the bottom landing field on a part of the ridge that is not working. The ideal direction is a WSW or SW but even then the wind gradient on the approach can be very powerful and difficult to predict. Talk to an experienced HG coach first before attempting a top landing at Dunstable and ask for a demonstration! Always look out for gliders overtaking on the ridge side. Check for hang-gliders and LGC sailplanes. Top landing can be tricky in strong winds, especially in the bowl. If in doubt, get advice on the day from a coach or land at the bottom. There is no ground handling practice allowed at Dunstable Downs except by permission from the National Trust. If you wish to practice ground handling at Dunstable Downs then please approach the National Trust Wardens at the Gateway Centre. If the NT deems it is safe to do so they will direct you to a suitable area south of the Chilterns Gateway Centre. The bottom landing area is to the North of the Gliding Club field and near the southwest bowl. i.e. to your right as you look out from our main Middle Take off. Avoid damaging the crop. There are two fields. If one has crop then land in the other. If they both have crop, try to land on the tractor track between the two fields. In summer the crop gets very high in both fields, this makes the landing technically difficult for Hang-gliders and probably not suitable for low airtime pilots who cannot guarantee top landing. Do not land in the Gliding Club field. An LGC sailplane, low over the airfield will have limited avoidance options and LGC tug planes trail flailing tow lines. There is an exclusion zone in the field bordering the Gliding Club field for both hang-gliders and paragliders because of this. Lose height above the bottom fence line to avoid flying into the path of LGC sailplanes and tugs on finals. Turning in to the field at around 50 ft above the bottom landing field, and adjusting for wind direction, make a straight descent to the landing point. In light winds a good flare may be needed. Hang-glider and Paraglider Exclusion Zone. The ‘Orange’ coloured area on the Map, is part of the bottom landing field nearest to the LGC field, should not be entered below 800ft AMSL. Do not enter this zone or even land in this area. There is a danger of interfering with the final landing approach of a glider or tug. There is also a risk of coming into contact with the tow rope behind the tug planes. The National Trust expects us to land in the designated areas only to reduce the disturbance to other visitors and damage to the flora. The escarpment at the Downs has SSSI protection and in order to reduce damage slope landings are for occasional use only. Be especially aware of the risks posed by rabbit holes and mole hills on the slopes in the bowl, in front of the main west, southwest launch and on top of the Pimple. Avoid getting low on the ridge over the near the main Power Lines. In the event of being unable to reach the DHPC bottom landing field, pilots should have enough skill to slope land safely on the hill. If you are uncertain of your skills do NOT venture too far from the Bottom Landing field. Bottom Landing - IMPORTANT NOTE! The Bottom Landing fields are ALWAYS available for pilots to land in. There are no restrictions for any pilot who wishes to land in the Bottom Landing Area. We repeat, as long as you are Bottom Landing you may fly into the ‘Yellow Area’ at any time, but try to land in the striped zone as shown on the ‘Map D’ image. 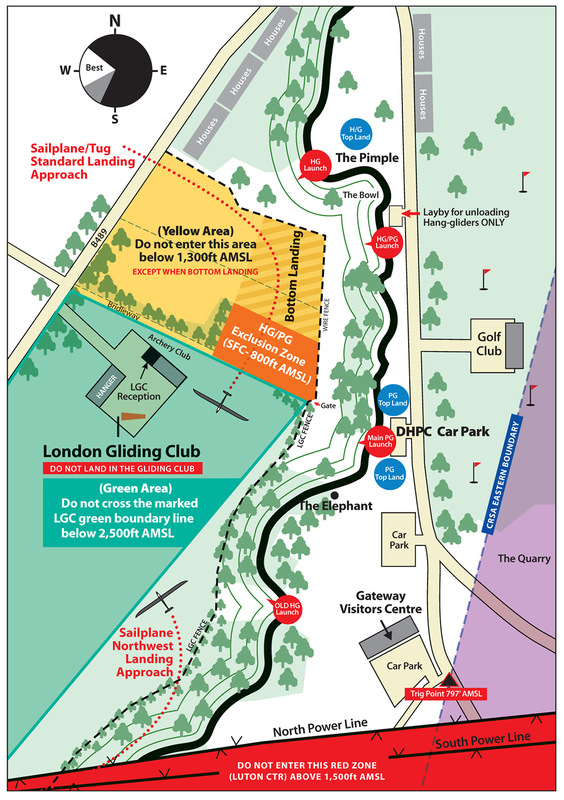 Green Area: Pilots must not fly over the London Gliding Club marked Green boundary area below 2,500ft (762m) AMSL. 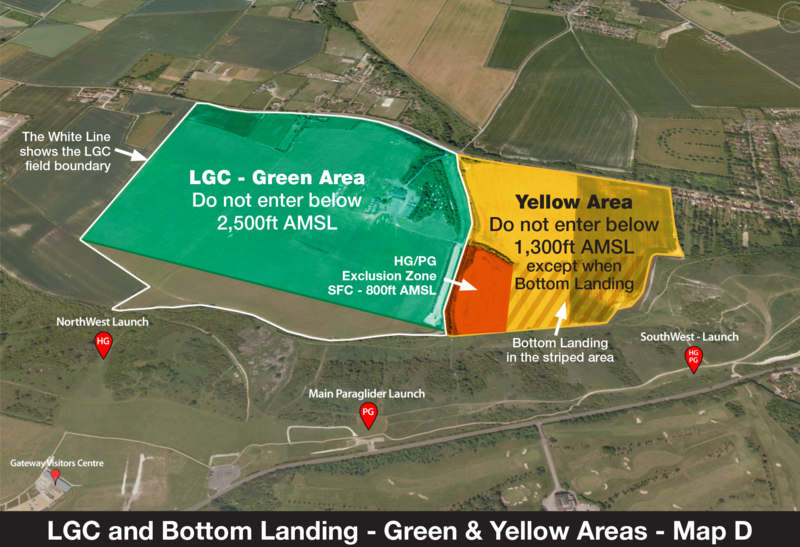 Yellow Area: Pilots must not fly over the Bottom Landing field boundary area below 1,300ft (396m) AMSL – EXCEPT when actually landing in the agreed Bottom Landing fields. Note: Pilots getting low in altitude after flying over the villages out the front of the hill, and now wanting to return to the ridge, are allowed to transit back through the ‘Yellow Area’ below 1,300ft AMSL when flying DOWNWIND ONLY, back towards the Ridge. Once inside the boundary of this ‘Yellow Area’ you must continue in a straight line right through the Yellow Area and then back onto the main ridge. A constant lookout for DHPC gliders, sailplanes and other LGC aircraft landing should be maintained when returning to the ridge through the ‘Yellow Area’ under 1,300ft AMSL. Orange Area: Pilots may NOT enter the HG/PG Exclusion Zone, AT ANY TIME, from the surface of the field up to 800ft AMSL, which is approximately level with the Trig point on the hill (797ft/243m AMSL). This is to protect LGC Sailplanes and Tugs on the lowest part of their final landing approach. Landing inside the London Gliding Club field is FORBIDDEN at all times – UNLESS you have a real in-flight emergency and you have to land safely! Report the incident report and copy to the DHPC Safety Officer or Lead Coach and LGC controller IMMEDIATELY. File an official BHPA Incident Report and send a copy to the DHPC Safety Officer. Apologies in writing to LGC for any inconvenience caused within 24 hours. In order to protect the public and other air users, it is the responsibility of all DHPC members to stop any unauthorised flying at the site. This includes pilots flying without a helmet Airspace Sticker. Bring any breach of the Letter of Agreement to the attention of a club official immediately. They should take charge, but it would be helpful for them to have the support of as many DHPC members as possible. If no club officials are available, then take responsibility as a member and contact one as soon as possible afterwards. Make anyone preparing to fly without proper authorisation (and this includes people who do not have a visible Airspace sticker) aware that they are breaking the law and face a fine of £2000 and six months in prison. Contact NT staff if they don’t stop immediately. Record names, date and time, witnesses, glider type and colour, and car registrations. Photographs would also be very helpful. (i) The person in charge must not fly a SUA in Class A, C, D, or E airspace unless direct permission by the appropriate air traffic control unit has been obtained. We operate within D-Class airspace and SUA flying is not covered under our Clubs Letter of Agreement, therefore Drone flying at Dunstable Downs is illegal. Please speak to anyone you see flying these SUA’s and advise them of the current Airlaw. If necessary, the Police will send an officer to site to issue a caution and take statements from witnesses. They will send the information to the CAA Aviation Regulations Enforcement Department for use in a prosecution. Inform the LGC if it looks likely that the unauthorised flight could affect their operations in any way. In the event of an incident, one person at the scene should take charge and in order to prevent multiple calls, one person should be delegated to call the Emergency Services. Inform the National Trust Countryside Manager at the Chilterns Gateway Centre of the details. Details at the bottom of this document. Luton and Dunstable Hospital - clearly signposted on the A505 Dunstable to Luton road, less than a mile east of Dunstable town centre.